It is about a year since the words ‘narcissistic abuse’ appeared on my radar. That ‘eureka’ moment of reading online about a set of behaviours and matching them to what I had been experiencing with a ‘friend’ will be ingrained in my memory for ever. I’m not going to retell the tale of that friend. Suffice to say it was hurtful, beyond comprehension at the time and not an experience I ever want to repeat. But, here I am a year later with no contact set in place , and I can reflect back on what I have learnt from this life changing encounter. Well for starters, I have learnt a whole new vocabulary. Gaslighting, projection, blame shifting, who knew?? Well me now! I read everything I could lay my hands on for months, I spend many, many hours on narcissistic abuse forums and websites. 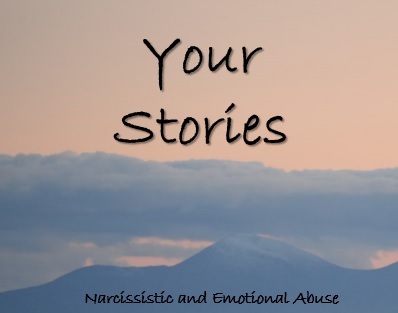 I began to see the patterns and similarities of my story with others’ experiences. The same phrases uttered; ‘you’re too sensitive’, ‘that didn’t happen’ ‘I didn’t say that’, ‘what is wrong with you’ ‘I’ve never had problems like this with anyone else’ ‘that was your fault’ , ‘you just don’t get me do you’, ‘why do I always need to explain myself to you’, ‘Do you think you can control me’ (!) and that’s just the regularly repeated ones. Guess what though – turns out it wasn’t just me on the receiving end of those phrases, but that these seem to be taken straight out the virtual emotional abuse manual issued to the toxic. Seeing the similarities made me see that I was indeed not alone in having being manipulated by someone with no empathy and a need to control. I found that reassuring as much as extraordinary that I’d never been aware of all this before. I’ve more or less stopped checking the websites now, just the occasional peek, and Amazon has stopped the ‘ how to spot a sociopath at 10 paces,’ recommendations for my reading , but the experience still sits within, with a degree of sadness . It has made me look at other friendships with a more judgemental eye. In some cases, I’ve put some emotional distance between people I now see as not being particularly kind or caring. I can also see that I have always given people too many chances, been too keen to excuse inconsiderate behaviour and allow people to treat me in a way I wouldn’t dream of treating them. Not anymore. I’ve also realised that some of my friends whom I used to regard as more sedate and therefore less exciting, are in fact the very people who have always acted with genuine kindness to me and I’ve made much more effort to just enjoy the company of these kind people, even if it isn’t out having wild times with them. I’m appreciating the authenticity of these people who don’t have an agenda of stealthy control and manipulation disguised under the pretence as being a pal. I do look back with regret. I can see how easily I was drawn into this toxic relationship by ignoring my instincts because I felt flattered by the attention offered and enjoyed the spontaneity and the novelty of having a friend who seemed SO in tune with me. But ,and what a but, I can also see how it was all an act to pull me into a relationship where my expectations were slowly but surely lowered to actually accepting abusive behaviour. Where I felt that I had to try really hard to maintain the approval of this friend. Where I began to feel like the effort was one sided, where all promises were broken, where my personality was under scrutiny and found wanting on so many points and …oh you know how it all ends with these kind of people! I’ve had to deal with mutual friends asking what happened many times. Initially I felt I had to give a blow by blow account with all the ensuing reactions but now, when asked, I just say we don’t really see each other anymore. I’ve even asked some people to stop giving me any information about my former friend as I’m not interested. In one case, the person seemed unable or unwilling to not act as a good between so I’ve also cut my connection with him. No great loss really. Anyone who has been through an experience like this will appreciate how hard it is to make sense of. The idea that some people thrive in actively abusing someone they claimed to love and create an illusion of who they really are to hook you in, just sounds so twistedly unreal but I reckon I would recognise the warning signs now . I’ve found writing about my experiences very cathartic. To share my story anonymously with sympathetic people who understand has helped me enormously. I have realised that the qualities of mine that made me so attractive to my former friend are the very qualities that I should focus on acknowledging more to myself. More self care, and self-compassion are going to be my focus from now on. I hope you too can join me in those goals and thrive and flourish in a future free from toxic behaviours. If this helps just one person I’ll be happy. Thanks to the recent papers what’s happened over the last 2 years that was my sad secret is now there in black and white for everyone to see. So here’s why I stayed. Anyone who would like to share this you’re more than welcome too. I want to clear the air on a few topics that are dancing around in my head at the moment. Deep breath*Ever since I have moved I have had a chance to breathe. As many of you know my childhood, teen and adult life has not been ideal. Abuse, failed marriage, death of both parents. I’ve had my fair share of heartache. Anyone who really has the knowledge understands that in abusive relationships the abuser breaks the victim down emotionally and tries moulding them into who they want them to be. That’s what happened! For many years I was a empty shell for filling someone else’s path. When I left I didn’t know up from down or left from right. I didn’t know who I was or how I was suppose to be. For two years I cut the strings of everything negative in my life. Especially people!!! I had to separate myself from many. Not because of how they were but how I was. A broken girl who couldn’t handle negativity. I have learned that negativity is toxic. And to continue building and finding who I am. I plan on continuing this “detox” for myself. I have been super proud of myself for finally stepping away and finding myself. Who am I? I am someone who has seen the darkest days and never let that effect my heart towards life. I like nature!! Who knew!! Caves, waterfalls, hiking, fishing…. I’ve learned that “Tiffanie” would rather lay in a hammock on top of the mountain then shop! Don’t get me twisted lol I still love shopping lol But being up here has showed me the beauty I have needed to see for so many years. I am still fighting this battle but it has been an awakening for me so much so that I made a post on this on my site. I’ve read, learnt and gain so much knowledge it’s my duty to share my experience and create even more awareness your page has played a key part in my journey. Thank you. When I was a little girl my mother used to refer to my Granma and aunts (her in-laws) as “those people” and she still does, little did she knew that “those people” have a name that’s attached to them they are called Narcissist. I grew up very confused as to why she tried her very best to protect me form those people; after all they are my blood. They called her crazy, I called her crazy. I mean why would my mother separate me from the people I love that took care of me, lavished me with toys and gifts and everything imaginable. Now that I am an adult I find myself fighting the same battles my mother fought when she was my age. I came from a whole narc family grand ma, dad, and two aunts and if that wasn’t bad enough I went ahead and married a narc!!!! Of course at the time I never heard of the term narcissist or NPD that until I married the narc himself and noticing the red flags. With tremendous amount of research I pieced together the twisted puzzle I was in. Here’s my description of my NPD husband. He’s like a volcano always bubbling always ready for eruption it only takes one more vibration and then Boom!! Explosion!!! Then he simmers down, always simmering, always bubbling over the edge eagerly ready and waiting to explode again. It’s the etching away of yourself overtime if they become successful you will be left, broken, exhausted beyond belief, complete loss of true self. There is hope, I am living proof you can overcome. I have completely gone no contact with my narc family I haven’t divorced my husband yet, however I have implemented strict strategies to detatch myself from him and I am able to still keep my sanity. I am reaching out to other wives that’s tied down to their narc husbands and family members. Low contact or no contact is the ultimate goal but when it’s not possible we must support and learn their tactics and implement strategies of our own. I hope I can be source of hope to anyone who hears my story.